August 21, 2011 – We have updated this post with pictures shot on the same trip not previously posted. 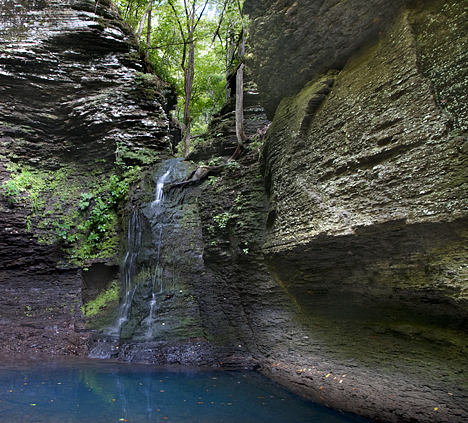 You’re looking at the middle fingers of “Six Finger Falls” on Falling Water Creek northeast of Ben Hur, Arkansas. The falls, probably over eons, have carved six sluices through solid rock, giving rise to the name. This story, along with another picture of the falls started on the Photo of the Week page on Corndancer Dot Com. Click here to go there and see for yourself. Upstream from Six Finger Falls is “Falling Water” falls, on, you guessed it, Falling Water Creek. Coming north on county road 1205 from Arkansas Highway 16 (east of Ben Hur), you pass Falling Water Falls. On this trip you get two, count ‘em, two falls for the price of one. Many people who make the trip, always take a gander at both. On the way to the falls, if you come in from the Ben Hur side, you will see this old structure. I’m betting it is now a deer camp, formerly a residence. The outside decor includes everthing but a kitchen sink, and that may be on the other side. Past the alleged deer camp a mile or so, you cross Falling Water Creek via this low-water bridge, mostly out of the picture. 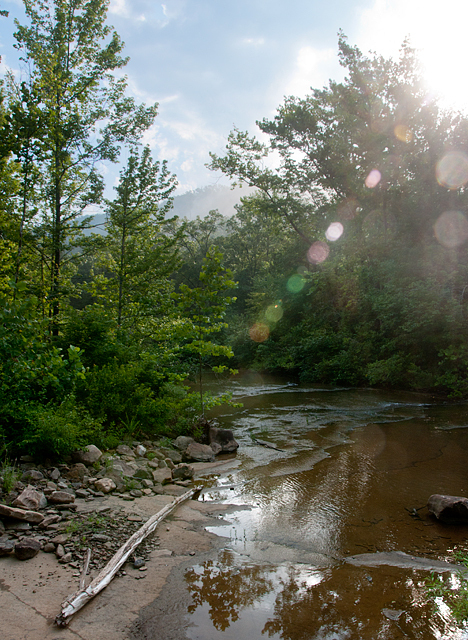 You are looking downstream. Rotary Ann Overlook on Arkansas Highway 7, south of Pelsor. The view is to the west. The overlook is legendary for spectacular sunsets. On the way to Falling Water Creek, earlier today, I passed “Rotary Ann Overlook” on Arkansas Highway 7, south of Pelsor, Arkansas. The mountains from the overlook were still shrouded in morning mist, a breathtaking sight. 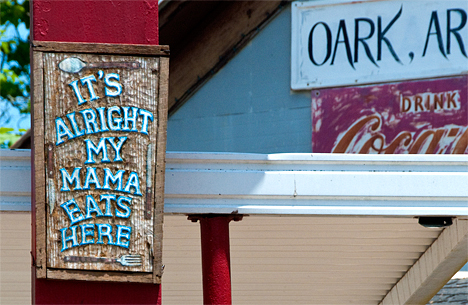 Oark General Store, according to local sources has been in continuous business since 1890. After the waterfall adventure, I proceeded to Oark, Arkansas and the Oark Café and General Store for lunch and a shoot, in that order. Breakfast seemed to have been a week ago. Crawling around waterfalls will do that to you. The current store owners, James and Carla recently bought the store, taking their place in a parade of former proprietors. Like many country stores, a big part of their business is the café. The Oark General Store Cafe is not only a popular venue for local folks, visitors from outside the community also frequent the tables. The area to the right (shelves and drink boxes) was partitioned as a feed warehouse in the fifties. A concrete floor for the warehouse replaced the original wood floor in that area. Other than that, the ceiling and floors in the building are exactly as they were when the store was built. Eclectic decor with the checkered table cloths amplifies the down-home feeling experienced in the store. This was true for the previous owner as well. This is not my first time at the Oark establishment and it will not be the last. James and Carla are continuing a tradition of good vittles. I sinned with a chicken fried steak, gravy, mashed potatoes, purple hull peas liberally seasoned with bacon, a salad and a huge roll. I could feel my arteries constricting, but nevertheless reveled in this revered culinary delight. Angela, the Oark General Store and Cafe chef with “Hooter,” the official store dog. A good sense of humor underscores the inherent goodness of the cuisine. As I was leaving, I visited with Chef Angela, the creator of my yummy artery clogger. She was relaxing on one of the store porch benches, required furniture if you are to be considered as an official southern country store. She was visiting with “Hooter, ” the official store dog, also a spiritual requirement of country storedom. Hooter, Angela says, “came with the store,” when James and Carla made the purchase. It appears that everyone has nicely adjusted to the transfer. Angela and Carla both say that Hooter has a strong Catahoula genetic presence. I have to agree. But I can see some Blue Tick and mebbe a of smidgen of Rottweiler. I’m thinking it doesn’t make much difference to Hooter one way or the other, since he seems to like everyone he sees, regardless of his coding. Good attitude Hooter. Would that there were more like you, four and two-legged. 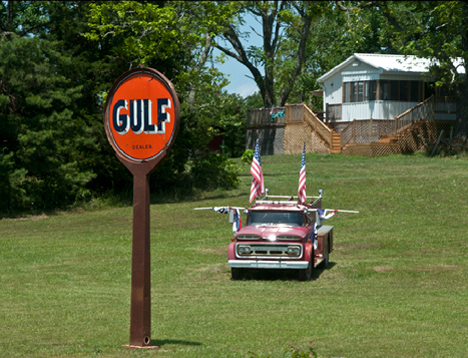 On the way to the store from the Finger Falls, I saw this old fire truck with an ancient Gulf Oil Co. sign standing guard. It has some sort of extensions which remind you of a shrimp trawler. There’s probably a good explanation, but it escapes me. The last shot of the day as I descended to the flat lands was Harmony Presbyterian Church. As I recall, more than 100 years old and holding up well. Margaret Phillips in her store, L.M. Phillips General Merchandise in Fountain Hill, Arkansas. Margaret Phillips of Fountain Hill, Arkansas is the proprietress of L. M. Phillips General Merchandise, a store founded by her late husband and brother-in-law in 1925 in Fountain Hill. Maggie, a precocious Border Collie (a given), is Margaret’s keeper. This story started on the Photo of the Week page at Corndancer dot-com. To see more pictures and get in on the start of the story, click here, a very cool thing to do. Click on Maggie for more pix of her and Margaret — and a great story. When I first set foot in Maggie’s territory she gave me a welcome like I was Attila the Hun with my band of merry barbarians in trail. Fortunately, Maggie and I set a new indoor record settling our differences and I was able to converse with Margaret Phillips and her assistant, Denise Musgrove. Equally fortuitous, for both of us, Maggie discovered that I was a willing scratchor and pettor and she already knew she was a willing scratchee and petee. L. M. Phillips General Merchandise occupies the former premises of the Bank of Fountain Hill which, like a lot of small banks of its era, gasped its last breath in 1933. The old bank safe is still in place at L. M. Phillips. A great place to hang a calendar. Occupying a former bank premises, the store is typical of a lot of country stores, with the exception fresh foods. What they miss on that, they more than make up for with a variety of hardware, plumbing supplies, and other stuff they’ve discovered folks want. It is said that marketing is: “finding out what folks want, and giving them more of it … and finding out what folks don’t want, and giving them less of it.” Apparently the Phillips store is working that theory better than most. The store was doing a brisk business on the Saturday afternoon of my visit. The prevailing mentality of customers I observed was one of not merely a trip to “the store,” but the manifestations of one visiting with a cherished friend. Now ain’t that something in this day and time of fast food and the cattle-herding mentality demonstrated by far too many retailers. Maybe that’s why they’re still in business while others are long gone. My business concluded in Fountain Hill, I sallied forth on the long way back home, hoping for at least one more photo opportunity. My search did not take long to become fruitful. Near the Prairie Grove community northeast of Fountain Hill I encountered John Cruce, driving two mules and a wagon. John Cruce, his wagon and team pull up for a visit in the side yard of the Prairie Grove Community Center, northeast of Fountain Hill, Arkansas. For his day job, John Cruce is the proprietor of a prosperous saw-mill business. For fun, John has nine mules and keeps them because that’s what he wants to do so. The nearby city of Crossett puts on a fine PRCA rodeo the first week of August. John will drive his team and wagon from the Prairie Grove Community to Crossett and participate in the parade and a performance of the rodeo and return home. John Cruce fixes a twisted bridle, which made for a nervous mule. The trip to Crossett by vehicle takes 45-minutes to an hour or so depending on the lead in your foot. In a mule drawn wagon, it’s a three-day trip. John loads his wagon with feed for the team and heads out. They overnight at several friend’s deer camps between Prairie Grove and Crossett. The east view of a west bound mule team. Riding shotgun in a mule wagon. While I was visiting with John, the white mule began to act a bit nervous. John didn’t seem to be deeply concerned, but we both agreed that she might be a bit more at ease if I was in the wagon instead of standing beside it. In the process, John noticed that her bridle was twisted. He fixed that and the problem was solved. In the meantime, I had the opportunity to see how it was to ride shotgun on a mule drawn wagon. There’s a first time for everything. Earlier in the day, I saw Drew Presbyterian Church, just north of the Drew-Lincoln County line. At the time, the sun was not in the right place for a decent shot. The good news is the front of the church faces due west, so the sun angle was predictable later on. Drew Presbyterian Church, US Hwy 425, north of Monticello, Arkansas. 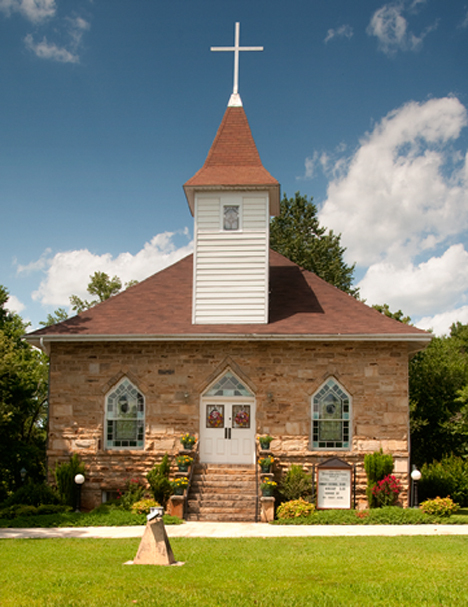 The church was organized in 1859. The building is listed on the National Register of Historic Places. The timing was right. My seven-fold amen for the day was at the church about 1730 (Mickey’s little hand is on the five and his big hand is on the six) or there about. The start of the golden hour this time of year. Actually in July, the golden hour lasts about three hours or so depending on what’s in or out of a shadow. Ain’t life grand! This is not a service station nor will it be. It is a "work-in-progress" family gathering place styled after West's Grocery, formerly in business near Tarry, Arkansas. Eighty five years ago, Laverne Lyle Barrett was born in the home where she now lives. Next door to that home is the building you see above, a new family gathering place, crafted to resemble her daughter-in-law’s father’s store. This story started on the Photo of the Week page at Corndancer dot com. Click here to see more pictures and get in on the beginning of this story. Laverne Lyle Barrett's home and birthplace was built by her grandfather in 1895. The new family gathering place under development by her son and daughter-in-law can be seen to the right. Laverne Lyle Barrett shares her home with her three dogs, Rip, Nip, and Gip, all unsolicited gifts from nefarious dog dumpers. Laverne and her neighbor and daughter, Gail Lane provide a home to eight dogs so dumped. It did not take long to figure out that Laverne Barrett's face is normally in the smiling mode. Here it is even more so as talks about her dogs. Laverne’s family settled in the area probably around or shortly after the civil war. By 1895, when the house above was built, the Lyles had five sons, a farm, cotton gin, sawmill, blacksmith shop, store/post office and a brick kiln. Laverne’s father, Cullen W. Lyle was born in 1887, in a log cabin near the large trees to the right of the house picture above. 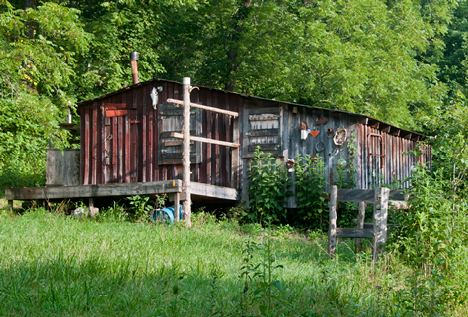 Her grandfather built the cabin and the house. Laverne says her father told about her hauling cotton bales on a mule wagon to Pine Bluff, some 30 miles or more to the north by todays highways. All farms, before mechanization and electricity had a number of outbuildings to serve utilitarian purposes. One such example is the corn crib below, adjacent to the new building. Laverne is ready to tear it down, her children beg to differ and right now, they are winning. This corn crib is around 150 years old. The logs were set with gaps small enough to keep the critters out and big enough provide adequate ventilation to the stored corn. This gravity pump and Conoco sign were moved here from their original location at Wests Grocery. The gas pump you see was used before a safe and reliable electric pump and meter combination were available. The long handle to the right of the was attached to the actual gas pump. As the operator moved the handle back and forth, gas was pumped to the glass container above. Each of the graduations on the vertical thingamabob in the glass container were used to determine how much gas was being pumped. When the proper amount was in the glass. The operator put the nozzle in the tank, pressed the handle and good ol’ gravity gassed up your car. If you bought your gas at a “fillin’ station,” about the only merchandise you would find included tire patching supplies, oil, anti-freeze and a few other auto related items. Food items were generally limited to sodas (known in the south as “cole-dranks”) and nickel sacks of peanuts. The cole-dranks were supposed to be, well, cold, but most of the time, any temperature below ambient counted as cold. Across the road from the house and meeting place is the original barn, in continuous use since it was built. This barn, by Laverne Barrett's estimate probably predates 1887. The round bin was a more recent addition. Probably replacing the leaning corn crib. Most old small town and rural fillin’ stations came complete with a resident dog. It was almost as if there were unwritten rules mandating Fido’s presence. The new family meeting facility will be no different, since there is a plethora of canine candidates to do the honors at the Barrett-Lane premises. You can't start too early. Dogs in training are apparently preparing to take up the serious mantle of being a "fillin station" dog, a time honored tradition without which no station is complete. The Barrett-Lane corner of the world is not only populated with fine human beings, it is also a treasure trove of photo oportunities. The goodies per acre count is off the chart. For that I am grateful and am grateful for the opportunity to report my findings. Half of the barn has collapsed and the other half has a serious leaning problem. Can you spell R-U-I-N-S? We’re looking at an old south Arkansas barn. From the looks of things, we better look fast. It is on its last legs, teetering on collapse. The story, on “ruins,” started on the Photo of the Week page at Corndancer dot com. To see some other pictures of the barn and get in on the start of the story, click here. A cool and rewarding thing to do. The “good” half of the barn, so to speak. Behind the leaning wall is a mid-seventies Ford Torino, (if my car ID cells are functioning properly). The barn is a typical setup. There was loft for hay, stalls for mules and other livestock, and dry storage for feed. In its time, it served well. While many of us look at the nostalgic aspects of an old barn, we tend to forget that the structure was part of a business. And that part of the agri-business has about as much use today as carbon paper does in a modern office. Still ……………. The house which went with the barn is still standing and in substantially better condition than the barn. It has what appears to be a “sleeping porch,” a now-forgotten part of many homes of the mid-forties and earlier. A sleeping porch was screened, preferably on the east side of the house since you were attempting to sleep in a cooler environment. Having stacked a few z’s on a sleeping porch, I can give the concept a hearty thumbs up. It has been a few moons however. Call it a "sleeping porch museum." When the house was deserted, bed springs were left on the porch. That seems to be the most popular thing to leave behind. In most abandoned houses I’ve seen, there are always bed springs or mattresses. Can’t get ‘em in a car I guess. The door is boarded up and one window is covered with corrugated roofing metal. A lightning rod and a lightning rod weather vane combination. Lightning rods are perched on the roof of the house. I once worked for a man who told me that if I saw lightning rods on a house to bore in and sell ‘em anything I could, because if they spent good money on lightning rods, they could be convinced to buy anything. Somehow, on the outskirts of a small southern town, you just do not expect to see a chopper on the porch. A couple of four wheelers, 50 gallon ice chest, a couple of cats, and a "broke-down" trolling motor, yes. A chopper no. Also a satellite dish and a TV antenna, no less.